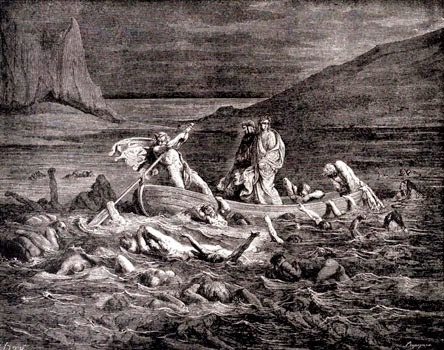 As Dante was reaching River Styx on his way back from the Underworld, he was expecting to hitch a ride back on Charon's boat, and then go to pay a visit in Purgatory. As things went, Charon turned out to be a rather nasty fellow. Instead of giving Dante a nice, hassle-free trip back across the damned river, he called his three best buddies. Dante looked at them. The monsters were pretty ugly overall. "You see, Dante, nothing is free in life - or death - except suffering," said Charon. "My three friends here, although they all look repulsive, are rather peculiar: one of them always tells the truth, another one always lies, and the last one is a bit of a lunatic: sometimes it tells the truth and sometimes it lies. You have a total of three questions you can ask them to find out which one is which. I'll take you on the other side of the Styx if and only if you can tell me, without a shadow of a doubt, which one tells the truth, which one is the liar, and which one is the lunatic one. Oh, I almost forgot to tell you - silly me - they can only answer yes or no... isn't life great?" What three questions will enable Dante to cross the River Styx? Each question is directed to, and answered by, only one creature. The creatures themselves know who is the truth-teller, who is the liar, and who is the lunatic. The solution does not rely on asking them questions that they are not able to answer due to uncertainty. eg, asking the liar or the truth-teller to predict whether the lunatic will say yes or no to a given question. Dante figured that first of all, he had to find out which of the three monsters was the lunatic one. Let's call the three monsters A, B, C.
In order to do so, he asked one of them (let's say monster A for this example) a question like: "If I asked a question to monster B, would I stand a greater chance of obtaining a truth than if I asked the same question to monster C?" If the answer was a "Yes", then it was safe to say that x couldn't have been monster C; on the other hand, if the answer was a "No", then x couldn't possibly have been Monster B. Once that Dante obtained this information, he used his second question to find out whether the monster that is definately NOT the lunatic one was + or -, and the easiest way of achieved this was by asking a question with an obvious answer such as, "Is 2 an even number?" After finding out whether the monster is the liar or the sincere one, the third question was used to resolve the other two monsters; a question like "Is monster A the lunatic one" did the trick.